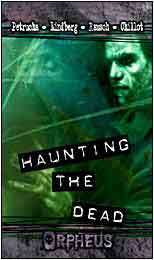 Haunting the Dead presents four all-new novellas from some of the most exciting voices in modern horror fiction, set in the world of Orpheus, White Wolf's game of paranoia and the paranormal. Agents of the conspiracy known as Orpheus can see the dead, but can they trust these spectres and banshees? And what of the voice that squawks through dead channels, warning of a disaster on the horizon?